I just want to take this opportunity to thank you for your professionalism and honesty as well as your knowledge of boat brokerage. As I previously mentioned I allowed my local marina, who serviced the boat, to put my boat on the market. Since dealing with you I now know that was a fatal mistake. My mistake was giving it to a marina whose main objective was to maintain boats; not to sell boats. My local marina informed me that numerous people looked at the boat but unfortunately that was not truthful. When speaking to a friend who worked at the marina it turns out that after having the boat for 2 years the marina misinformed me and had only shown the boat to 1 person, who actually just wanted to compare an Egg Harbor to a Sea Ray. Upon seeing the boat, you recognized the value in the boat and how well the boat was maintained. It is apparent that you delivered that thought to other brokers which resulted in other brokers forwarding that information along to their clients. Your advice to me during the entire process was greatly appreciated. Your knowledge of boat brokerage is evident as I witnessed you doing a massive email and marketing campaign to a plethora of brokers and marinas which resulted in you showing the boat to 2 prospective buyers within 2 weeks. As you know those buyers both placed offers on the boat which eventually resulted in the boat being sold, all of which took 4 weeks from the time you agreed to market the boat to the time it sold. I was very impressed with your honesty, professionalism and knowledge of your business. As the “selling” process moved forward your coordination and communication between the buyer and me was pristine. Life is a daily learning experience. I have learned that, if you want to sell your boat, don’t have your local marina or “friend” sell your boat, have someone who does this exclusively for a living sell your boat. On the east end of Long Island, you, my friend, are that guy!! I will definitely recommend you to my friends and neighbors who may be looking to buy or sell a boat in the future. 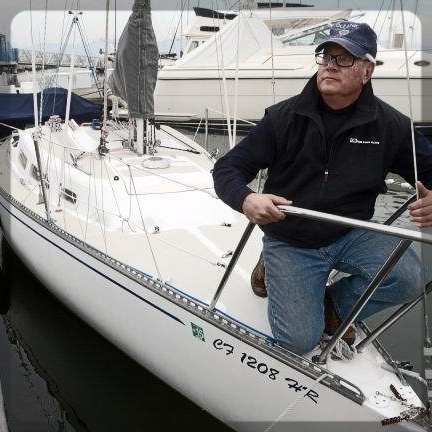 John Baier has been our trusted advisor and yacht broker for over 15 years, and we have benefited from his deep knowledge, skill, honesty and pleasant bedside manner. He is clearly one of the top yacht brokers in the country. While we usually think our next dream boat will be the last one we will ever need, if you love boats, you will end up needing a different one as your requirements change. So what we really need isn’t just a single friction-free transaction, we all need a trusted advisor to face the infinitely complex challenges of finding, buying, owning, operating, maintaining and selling yachts. I learned through experience that a having skilled broker performing this role in your corner is an essential requirement to boating happiness. While many of us have owned multiple boats over our lives, our perspective is incredibly narrow compared to a true professional who has dedicated several decades to the industry and has direct experience with thousands of boats. When we wanted to downsize from a larger trawler, John listened carefully and worked independently until he found the perfect solution for us. He arranged the purchase of a Nordlund 52 which was exactly the boat we wanted and needed, at exactly the price point we wanted to spend. This wasn’t a boat that I would have found any other way, and John handled the deal with integrity and with an over-the-top level of service we were delighted by. His sage advice was invaluable over the years of ownership and upgrades. We raised two of our kids on that boat and have priceless family memories. We recently moved to Seattle (cruising heaven) and decided a newer boat with even more range was called for. I found a well-maintained Symbol 57 at a boat show but I wasn’t very comfortable with the broker representing both us and the seller. I called John in to represent us and he was extremely helpful. It turned out that my concerns were well-founded — the “reputable” local broker was anything but that. John skillfully navigated what could have been a disaster with calm confident integrity, and made a difficult situation easy for us and fair for everyone involved. What a pro! On all of our transactions, he has reduced our risk, minimized our effort, built our confidence, and saved us significant money. It has been said that the happiest days of a man’s life are the days he buys a boat and then sells the boat. I have been in boating for over 50 years and have enjoyed the many pleasure of buying and selling several boats. I am writing to say our recent purchase of an Ocean Alexander 43 through you was a testimony to this nautical tradition. Thank you! Our purchase was challenging as the boat was involved in a difficult probate involving heirs, attorneys, documentation requirements, a short turn around and a very nervous wife. Your manner both in working with us to navigate these challenges, as well as the patience you demonstrated, was refreshing. From our first contact to our most recent, my wife and I have always felt you were truly concerned about maintaining a very high level of professionalism while addressing all of our boating concerns. The process of purchasing the Nan Sea Jean was filled with many fond memories that will accompany us as we explore the San Francisco and Delta areas. I think one of the tests of any business relationship is how it is formed in its conclusion and long after the sale has been completed. What makes us most happy is that we have continued to maintain a friendship built from a challenging task that resulted in a very favorable outcome. If we are ever in the market for another boat, you can be assured we will seek you out to represent our boating needs. Again, thank you for displaying a high degree of professionalism and sensitivity with our new purchase. I have worked with Rick Peterson on more than one occasion and most recently in the successful sale of one of our boats. Rick is knowledgeable in his field and professional in his conduct and most importantly, meticulous in his communications with his clients. I would not hesitate to recommend Rick to anyone thinking of listing his or her boat with a broker. Rick Peterson was my representative for the sale of my Fu Hwa 38.......This was my fourth sale of a vessel over the last 13 years and by far the best handled in all respects. Rick was an excellent advisor on pricing, marketing and presentation of the vessel. His knowledge as a yachtsman was invaluable in preparing the vessel for sale. He always looked after minor items requiring adjustment or repair with no fanfare or recognition. He was my trusted advisor throughout the process. The vessel was located at the opposite end of San Francisco Bay with respect to Rick brokerage offices. When this has been the case with previous sales, there has always been reluctance to show the vessel in person because of the travel time involved. That was not the case with Rick. He was perfectly responsive to potential buyer demands for showings on several occasions, always with his characteristic gracious attitude. Finally, Rick was able to market and sell my vessel during a down cycle in the boating business and in record time for me - just over four months! Previous sales of my vessels in similar condition have taken as long as two years in the recent past. I believe that this is attributable to the fair-minded approach and trustworthiness of Rick’s sales techniques and to the substantial standing that he enjoys with his peers in the business across the land. I enthusiastically endorse Rick Peterson as a thoroughly professional and capable yacht broker for any type of vessel and would be happy to further discuss with any interested party. I just wanted to thank you so much for all the time and trouble you took to both sell our motor-sailer sailboat and to buy our new motor yacht. It really cannot have been easy dealing with the two but you somehow managed to get us a good deal on both counts! We are extremely happy with our new boat and how lucky were we that it all took place in one marina! I know you are someone I can count on to help if there are any emergencies but most of all I would like to thank you for your patience and good nature when things became quite heated! We will certainly be using you again should we decide to buy an even bigger boat! My name is Scott Scherer and I want to take a few minutes to articulate my impression of working with yacht broker Joe Biondo from Oceanic Yacht Sales. I have recently done a great deal of business with Joe, buying the C&C 115 sailboat ‘Warp Speed’ through him. Please find my comments on my experience with him below. - a. He answered every question I put to him. - b. If he didn’t have the answer right away, he found the answer and responded back with it in a VERY timely fashion. - c. He clearly explained the process and concepts surrounding buying a boat through a yacht broker. If I didn’t get it the first time, he was patient with me and re-explained it until I got it. d. He has a wealth of boat owner knowledge that I have been able to tap into and learn from. 2. Joe was always personable and always conducted himself with a positive attitude. - a. He never displayed any negative emotions or unwillingness to help towards me. - b. We did have some minor trouble with the rigging surveyor (not always returning calls or e-mails, seemed distracted when communication did actually occur, failed to meet initial schedule, initially refused to give us report until he was paid for fear of not ever receiving payment for services rendered); however, Joe diligently kept on top of the situation and ensured that we had a quality rigging survey and the subsequent report all the while displaying a MINIMAL amount of anger. On a small side note, there were times I was really upset with the rigging surveyor but Joe handled it before I became VERY angry. - c. Whenever we would meet face to face throughout the process, Joe would always have a smile on his face and would be VERY personable. - d. Even during times when I felt I was bugging him with TONS of questions per day, he was quick to respond to them and didn’t ever seem to convey that he was bothered at all. - a. Joe had an uncanny ability to clearly articulate himself and the particular fact or concept he was trying to communicate to me or any of the other people throughout the brokerage process. I never felt like he had to re-explain things in a manner I could understand, unlike many of my former academic professors. - b. Joe went above and beyond to make sure I fully understood the process, explaining every part in great detail so that I fully understood it. I liked this quality because I have an ‘engineering’ oriented mind and stuff needs to make sense to me before I can really remember it. - a. He was always quick to pick up the phone or respond to my e-mails promptly concerning any and all questions I had. - b. I have reached out to him a few times since the sale for questions regarding the boat and previous seller, he did in fact respond in a timely fashion even if it was a weekend. - c. He has given me several recommendations for various boat service personnel. - d. He personally screens each surveyor and other people involved in the brokerage process to ensure his respective customers get the best quality results for their money. - e. Joe was personally recommended as a good, solid broker to work with by my boat financing agent: Max Salvater with Sterling & Associates. 5. I WOULD RECOMMEND JOE BIONDO TO ANYONE WHO IS ATTEMPTING TO BUY A BOAT!!!!! Scott D. Scherer, Systems Engineer Sr.
Hi, Joe! First, we were attracted back to Oceanic as we had had a very pleasant introduction to John Baier several years ago. He provided our introduction to you and we were delighted that that your are a sailor first and a yacht salesperson second. We felt you performed a thorough assessment of our boat’s condition, equipment and additional items included in the offer. You put us in touch with a professional boat detailer who put put Nebbia into pristine condition. Your pictures were professional and very appealing. Only then did we work with you to set an asking price that we felt was fair, but aggressive. Throughout the process, you communicated frequently and kept us informed of showings and responses. As we contemplated price changes, we felt you kept us in touch with the realities of the market which made those decisions easier to make. You observed the inspections, surveys and sea trial and I believe were instrumental in keeping finding in perspective for a vessel of Nebbia’s age. We were pleased with the closing process. I have already recommended you to another sailor and would strongly recommend you and Oceanic to anyone selling, or buying, a boat! I want to thank you for the great job you did getting my much beloved old woodie GRAND CRU transitioned to a new owner. I have known John Baier since I bought the boat in 1999, so when it became time to sell I headed first to Oceanic, knowing that an old woodie, even one in the great shape this one was in, would be a difficult sale in todays market.. As you know we met through a mutual friend, another GB owner, so when I was ready I called you. You simplified a many faceted procedure and made it seem a lot easier than it really is. You put together a great listing for the internet complete with loads of pictures that showed off the boat to maximum effect. You even indulged me when I requested a higher asking price than you and Oceanic suggested. After a month with no action I had you reduce the price to a bit below your original suggestion, and the buyer interest appeared. The sale was actually closed while you were out of town and John Baier guided me through that critical period. I especially appreciated his experience based, thoughtful suggestions and recommendations. Thanks to you and the whole Oceanic team. We put our 1982 Grand Banks 42’ Classic for sale with Oceanic Yacht Sales in Sausalito in May of 2014. Skip Johnson was our salesman at Oceanic Yacht Sales. John Baier and Skip helped us determine an appropriate price that would make our Grand Banks attractive to buyers. Skip showed our boat at the dock of our home in Paradise Cay, Tiburon, which was very convenient for us. We were able to go on some cruises during the summer and Skip would show our boat after we returned to our dock. Skip was always prompt returning our calls and answering our questions. We got an offer on September 9, 2014 and after the sea trial, engine survey and haul out we signed the bill of sale on October 7. We received our check on October 9. The whole process was very easy and we give Oceanic Yacht Sales and Skip Johnson the highest recommendation. Skip became much more of a friend than just a salesman and brought his awesome dog Friday to visit us during some of the surveys on the boat which is docked at our home. Skip always went the extra mile and made the sale of our Grand Banks a very pleasant experience. We were amazed that our Grand Banks sold so quickly and glad we chose Oceanic Yacht Sales for the sale of our Grand Banks. As novice power boat buyers, we met Skip Johnson when viewing one of his listings and we never looked back. We did not purchase that listing but were soon in contract to buy another. Skip listened well to our needs and guided us in the right direction without pressure. After closing, he has continued to provide a wealth of information and assistance. We highly recommend Skip to all buyers and sellers. Just wanted to write a note to thank you for your help in the sale of my boat. You were very prompt in getting the boat on the market and kept me informed in terms of what steps you were taking to get as much exposure as possible. You were very sympathetic concerning the setting of the asking price for the boat. Once a buyer was found, the negotiations were handled professionally and an agreeable selling price was accepted. I also appreciate your after sale assistance in settling the odds and ends related to the buyers requests.